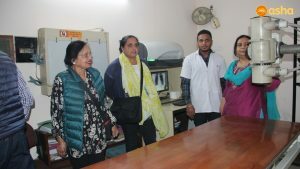 Dr Monica Pahuja (Principal Radiologist and the Head of Women’s Imaging (Breast and Gynaecology) at Monash Health), she is the wife of Mr Harish Rao, who is in the Board of the Friends of Asha Australia, visited Asha on November 5. Monica along with her parents, who are retired veteran doctors, went around the polyclinic at Asha’s headquarter. Dr Monica interacted with the patients and the Healthcare Consultant Dr Sharmila. 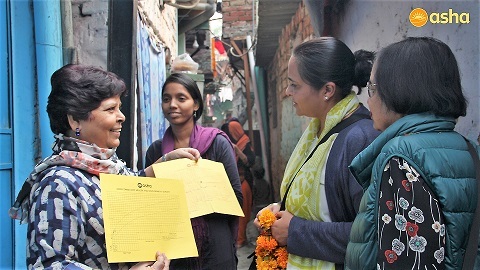 They discussed the health scenario in Asha slums and the medical devices available. She took a walk to the Physiotherapy room, O.P.D and the X-Ray room as well. She also checked and tested the X-Ray screen and other equipment all by herself. After a brief round, she headed straight to Asha’s Kanak Durga slum community where a heart-melting welcome was awaiting. On their arrival, the community welcomed them with the garland of flowers. 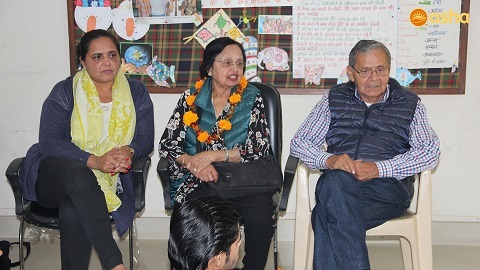 As soon as they approached the centre, a large crowd of Mahila Mandal (Women’s Association) members and Asha students swarmed around to greet them well. After a quick interaction, Monica discussed the career opportunities with the children and also communicated with the women. 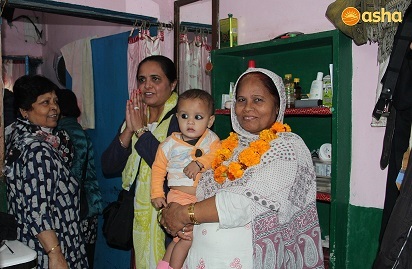 The incredible success stories of Asha’s intervention and the bravery of the slum dwellers made Monica and her parents praise them all. 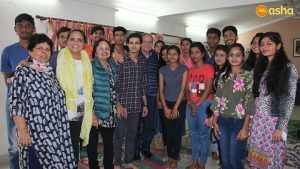 They were surprised to hear how the Asha students survive amidst slush yet manage to push themselves for a better future ahead. Dr Monica walked along the slums and visited a few shanties as well. 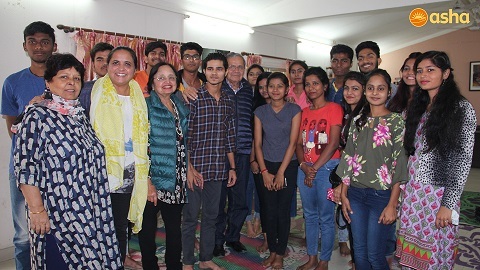 Afterwards, they bid adieu to all the community members of Kanak Durga Slum and left to meet Dr Kiran Martin, Founder and Director of Asha.